ETÓN is a company that designs devices that power in emergency conditions. Whether you need a flashlight, radio or communication charging device. Not only do you have a crank to juice up the unit, but some devices are powered through solar panels on the front. The FR160 is an AM/FM/NOAA Weather Radio. It also has a flashlight and cell phone charger (USB). 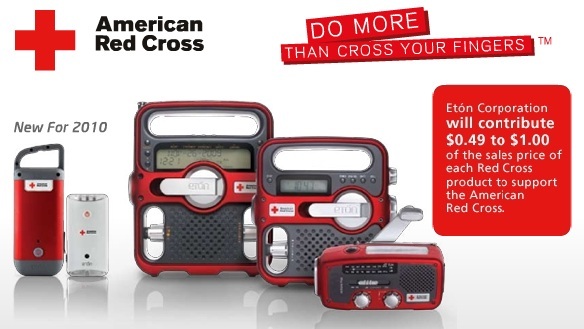 This is one of many devices endorsed by the American Red Cross. Prices are low (FR160 is $30), and ETÓN will also donate up to $1 for each item sold to the Red Cross. In this video, Todd Cochrane talks with Johnithon about Home Preparedness.